What a start to the track programme at the IAAF World Indoor Championships in Birmingham on Thursday evening, with a tremendous 3000m race and atmosphere heightened by a top British athlete in the thick of the battle for medals. Genzebe Dibaba of Ethiopia won a thrilling race to claim her third successive world indoor 3000m title as Laura Muir took the bronze. Muir went into this event as the double European indoor champion but her global record against tougher opposition had previously been less convincing. The Scot had looked in superb form throughout the indoor season and all went well with her preparation other than the weather necessitating a belated six-hour taxi journey from Glasgow as rail and plane options were scuppered. However, while she went into the race unbeaten this year, she had only faced domestic opposition. Here the field was awesome. It was led by defending champion Dibaba, the outdoor 1500m and indoor 3000m world record-holder. She had maybe not looked at her best this winter but still easily topped the 2018 world 1500m and 3000m lists and was bidding to win Ethiopia’s eighth gold in the last nine editions where they have won a total of 14 medals. Much of that success had not only been down to Dibaba but to Meseret Defar, who had won four golds, two silvers and a bronze over those eight championships. With Defar now retired from the track, the East African nation surprisingly chose junior Fantu Worku rather than 2016 runner-up Dawit Seyaum as their second option. Also in the field was the 2017 world 5000m champion Hellen Obiri and the 2016 world indoor 1500m champion Sifan Hassan, who won the world 5000m bronze in 2017. Other possible medal contenders were expected to be Shelby Houlihan, who finished with a 28-second last 200m to win the US Champs, Germany’s European under-23 1500m champion Konstanze Klosterhalfen and former European 5000m champion Meraf Bahta of Sweden. Most of the home crowd’s attention though was on Muir. Scotland have a good record in the event with Yvonne Murray having won by the record margin of 12 seconds in 1993 and Liz McColgan was second in 1988. Liz’s daughter Eilish was Muir’s team-mate here and, like Muir, is doubling up at 1500m. They have a much simpler task than McColgan senior had 30 years ago. She had 13 minutes recovery after her world record-pace 3000m and still placed sixth in the shorter event. They have a whole day to the heats. The race started at a relative jog with Muir ahead in 36 seconds with McColgan second and Dibaba at the back of the field of 14. The pace got slower rather than faster as Muir led the pack through 800m in 2:35.76 – over 80 seconds for that second 400m which is outside 10 minutes pace. Just before the completion of the first kilometre, Klosterhalfen pushed ahead and led through the mark in 3:14.67 and the pace picked up significantly. Halfway was reached with the German ahead in 4:41 and 1600m in 4:58.66. The next 400m she kept the pressure on with a 69-second section and gradually the contenders began to emerge as 2000m was reached in 6:07.62. Muir had been running on the inside in fourth or fifth but was having trouble moving up on the outside such was the increased tempo. Dibaba then shot ahead in the final kilometre and began even more of a drive for home and now eight were left in the battle for medals. The 400m between 2000m and 2400m was run in 64.5 and Dibaba now had a small lead with Obiri, Klosterhalfen, Hassan and Muir the only likely challengers. The Ethiopian’s 400m up to the bell was a vicious 62.43 and she was now clear but Hassan and Muir were in hot pursuit and began to close along the back straight. 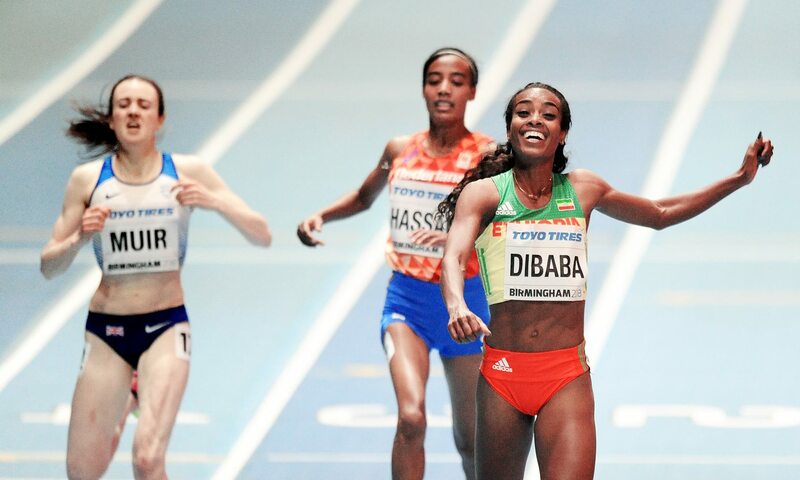 Dibaba held her form in covering that last circuit in 30.44 but even faster were her two pursuers. Muir got right up to the Dutch athlete’s shoulder and sensing Muir was closing, she moved from the inside to lane three, risking disqualification, and the pair finished about four metres back and separated by a 10th of a second. Dibaba’s final kilometre was 2:37 – around 7:52 pace – and the second half a very fast 4:04, which was 37 seconds quicker than the first half! “I’m very happy to be indoor champion for the third time,” said Dibaba. “This is a great competition and the race was fantastic. This day is for me and my country. “It was a tactical race and I controlled all the competitors. With 1000m left they all pushed very hard and at that moment I had to go and win the race. 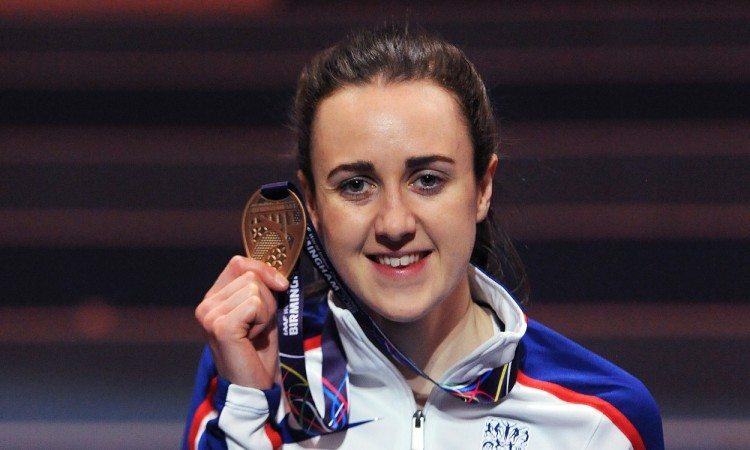 Muir was delighted with her first global medal and said: “Thank you to the crowd. I had to dig in on that last lap. I ran as hard as I could. “I felt so much more relaxed here than I was at Sopot four years ago when the pressure got to me. I did not intend to lead, just to stay out of trouble and then it was a case of following the pace and trying to run on the inside but stay in contact and wait for the move. Obiri was a distant fourth, four seconds behind Muir, with Houlihan using her kick for fifth as Klosterhalfen faded to seventh.